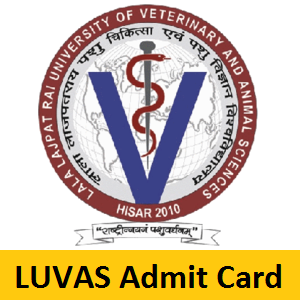 LUVAS Clerk Admit Card 2019 details are provided in this article. As per the Official notification, LUVAS Clerk, Non Teaching Staff Hall Ticket 2019 and the LUVAS Exam Dates are going to release probably in the month of February 2019. As known, there are 149 posts this year for Non-Teaching Staff such as Clerk, Steno Typist, Animal Attendant etc. So, more than 2 lakh applicants are preparing for the exam. Moreover, many of them started their preparation. So, refer this page to get all the details and happily prepare for the LUVAS Non-Teaching Staff Exam 2019. The Exam may be scheduled during the months February/ March 2019. 1.4 How To Download the LUVAS Clerk / NTS Hall Ticket 2019? For many candidates, it is a dream to work in such a well known University like Lala Lajpat Rai University of Veterinary and Animal Sciences. So, we suggest you utilize this beautiful opportunity and get placed in the Hisar and Haryana. The Lala Lajpat Rai University of Veterinary and Animal Sciences (LUVAS) conducts the process of selection for the Non-Teaching staff in 3 rounds. They are a Written test, and document verification followed by the Personal Interview. The Officials are recruiting the candidates for various posts in the Non-Teaching section such as Clerk, Steno Typist, Animal Attendant, Other posts. Also, the preparation for the exam s much more important for the candidate to follow before attempting the Written Test. Similarly, in our webportal, You can refer the previous papers and practice papers useful for the preparation. Get a lot more details by scrolling down. Most important thing while going to the examination hall is to carry the identification proofs issued by the Government. These are useful for only verification purpose. So, the candidates should carry any one of the below mentioned ID for the LUVAs Non Teaching Staff Exam. After downloading the LUVAS Clerk Hall Ticket 2019. Checking whether the details on your admit card are correct or not. Also, if any mistake or mismatch occurs, at that moment you should inform the higher officials to modify it otherwise, it may become a big problem while attending the Examination Hall. Hence, Below given are the credential details that are present on the Admit Card you should check for. How To Download the LUVAS Clerk / NTS Hall Ticket 2019? The new page is displayed on the Home page of your screen. Then, you need to check for the LUVAS Clerk Admit Card 2019 and click on the link you saw. In order to get your Hall Ticket, you need to fill the Login credentials asked for. Then, recheck the details you filled such as Registration Number, password etc. before submission. Next, you will find luvas.edu.in Hall Ticket 2019 with your Name. Download the Hall Ticket and make a copy of it for future usage. Finally, hope you guys clearly understood the details of the LUVAS Clerk Selection Process and luvas.edu.in Hall Ticket 2019. Similarly, you can have the latest updates in the same way by following our website Freshers Now regularly. Drop a comment in the below section for any questions and doubts. Soon we will respond with suitable answers. Thank you..! !